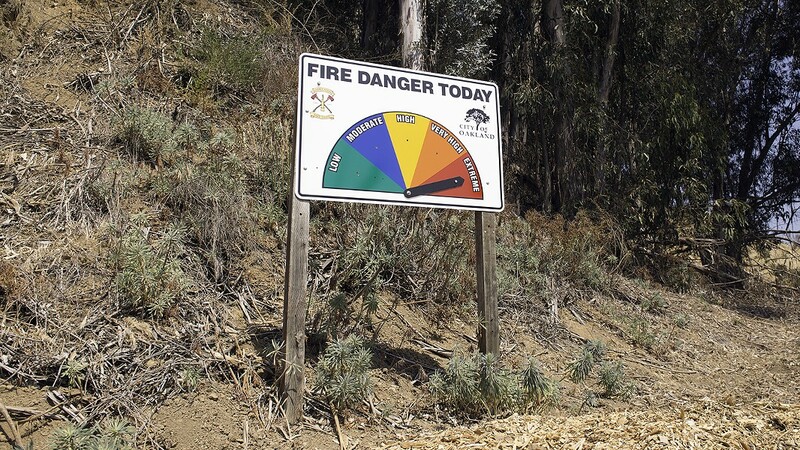 With dangerous fires becoming the norm in California, the price to pay for living in and near wooded areas can no longer be ignored. According to a recent analysis, Alameda County has one of the largest numbers of housing units at risk of wildfire damage in California. The evening sky over Oakland was beginning to turn a dusty brown as Susan Piper returned to her home in the hills after a children's birthday party with her four-and-a-half-year-old twins. It was Oct. 19, 1991, and one of the most destructive urban wildfires was just beginning. Firefighters, in fact, contained the blaze that Saturday. The next day, though, embers reignited. By late morning, an ominous ceiling of smoke had formed over the city. The fall wind was gusty and hot. Neighbors began stirring — some standing on rooftops for a better view, others milling about in the street, many calling one another and the fire department from their landlines, hoping to learn if there was any cause for concern. Panic erupted as a raging fire appeared over a ridge and plowed through the wooded neighborhood at the north edge of Oakland. The Piper family clambered into their two vehicles and drove down Hiller Drive and onto Tunnel Road, where bumper-to-bumper traffic stalled their escape. Flames burned on both sides of the road. Piper turned onto a side street and wound her way down the hill. A grove of eucalyptus trees above the Chabot Elementary School exploded into flames, and Piper said she could feel the melting heat from inside the car. "I was afraid the street would take us right into the flames, but I didn't tell my daughter that," she recalled. "I said, 'We're almost out.'" In fact, they were. The Piper family escaped, although they lost their house and most of their belongings in the Tunnel Fire, aka the Oakland firestorm, cited for years afterward as one of the most destructive wildfires in history. Nearly 3,000 homes burned and 25 people lost their lives. Nearly three decades later, climate change and drought are hot topics in California, where wildfires have become a year-round phenomenon and a serious existential threat to millions of people — especially those who live in what is termed the wildland-urban interface, or WUI, suburban zones where homes are essentially nesting in semi-wild, flammable vegetation. Last year was the most destructive fire year in California history, following a 30-year trend of increasingly large and uncontrollable blazes. This summer, flames have been roaring statewide for months, prompting mass evacuations. And wildfires are becoming more and more expensive. Firefighting costs in July alone ate up more than a quarter of the state's fiscal year emergency budget of $442 million. With the 2018 summer sky stained brown by smoke, it is increasingly clear that the East Bay will probably burn again. However, most fire experts and community leaders say not enough is being done to prevent the next catastrophic blaze. They want more prescribed burning to reduce fuel loads, increased funding for firefighting and wildfire research, and stricter controls on development in wooded areas. "But that's so politically contentious — it's a line politicians walk up to but turn away from," said William Stewart, a UC Berkeley forestry and wildfire specialist. He and others have put forth a question: As homes continue to be built in the WUI, to what extent should public resources be used to protect private properties built in known hazardous areas? "No state spends as much as California on protecting homes in the WUI," Stewart said. He noted that firefighters must prioritize the safety of humans, "even if it means the forest has to burn." According to a recent analysis, more than 2 million homes in California are at high or extreme risk of wildfire damage, and Alameda County has one of the largest numbers of units at risk. Meanwhile, debate has been raging in Sacramento about how liable investor-owned utility companies such as PG&E should be for wildfires caused by their equipment. PG&E may be on the hook for as much as $15 billion after last year's wildfires, and is now undergoing an extensive retrofit of its power supply system. The utility district is replacing or upgrading thousands of miles of lines, replacing wooden power poles and trimming back vegetation around high-voltage hardware. While PG&E has an obligation to provide power for any residents who have built their homes and managed their properties to the company's fire-safety standards, the utility may also be more proactive about preemptively cutting off power when the weather creates risky wildfire conditions. At the same time, lessening the utilities' liability could shift the burden to homeowners' insurance companies, leading to higher insurance premiums and less coverage in some areas, and to homeowners themselves in the form of higher energy bills. Although state lawmakers recently killed a proposal to lessen PG&E's liability for the time being, the issue likely won't go away. Like many high-profile fires, the Tunnel Fire prompted local and state agencies to undertake wildfire mitigation efforts, but they didn't get very far. Thinning of eucalyptus trees — known to be highly flammable — has been slowed or halted by litigation from a local homeowners group, and a local Wildfire Prevention Assessment District — basically a vegetation clearing task force funded by city taxes — has struggled to receive voter support. Critics argue that clearing all vegetation could present its own fire risk. As for building in hazardous areas, the California Department of Forestry and Fire Protection, or Cal Fire, has mapped out the state by wildfire risk for the purpose of informing county agencies in granting building permits, though this hasn't slowed development in even the highest-risk parts of the state.